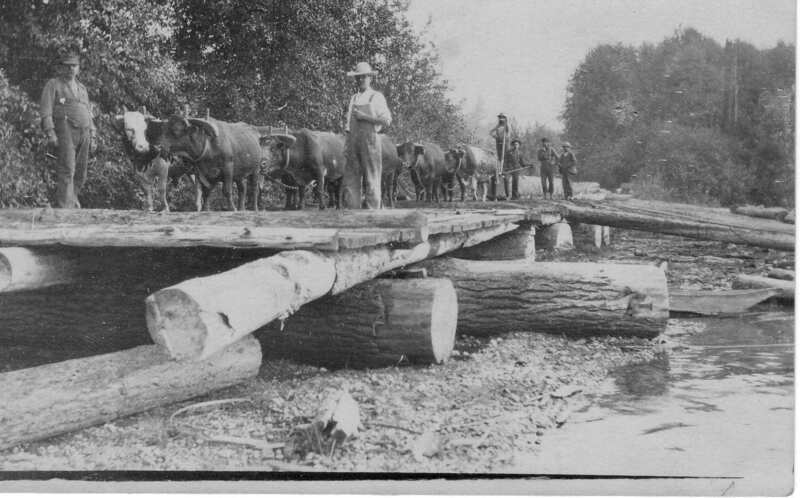 In 1896, a team of oxen would skid a load of logs on the east side of Lake Sammamish. After unhooking the team from log, the men would use peavies to roll the log down the skids and into the lake for rafting to the mill. For more historic images of logging in Issaquah, visit our Digital Archives. In 1893, the earliest known image of the Pickering Barn is taken, featuring members of the Reard and Geise families, who worked on the Pickering Farm for a time. The most exciting moments in any local history career are those when the pieces of history fall together and have a real impact on people in the present. One of those moments occurred in January 2003 when Paul Thomas donated an old family photograph. 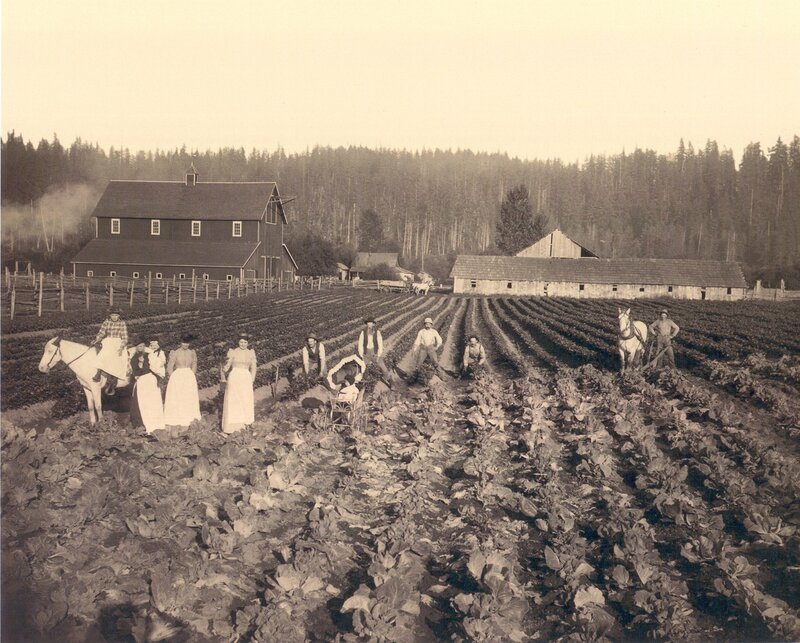 The photograph dates to 1893 and depicts Thomas’s family members standing in a field planted with celery and cabbage. In the background is the familiar form of the Pickering Barn, not more than a few years old. Thomas’s grandparents, who were tenants on the Pickering Farm, had passed down to him the oldest known photograph of the Pickering Barn. Mr. Thomas, who is also the founder of the Paul Thomas Winery, identified some of his relatives in the photograph: Jacob and Emma Reard, and their son John. Also pictured in the photograph is Albert Giese, one of the founders of the Northwest Milk Condensing Company. Jacob Reard was born in Luxembourg and later immigrated to the United States. He settled in Yreka, California near Mt. Shasta. There he met Emma Groat, the daughter of German immigrants. Jacob moved to Monohon, Washington and Emma sailed to Seattle later, in 1889. They were married in Gilman in 1891. They had four children who survived to adulthood: John, Herbert, Marguerite (Thomas’s mother), and Alice. Another son, Alfred, died in infancy. The family lived in the area until 1905, when they moved to Ephrata, Washington to homestead. As we talked about the photograph and the Reard family, Mr. Thomas mentioned that the Reards built a home on the Sammamish Plateau, after working the land at Pickering Farm. This comment got my attention and led me to the Sammamish Heritage Society’s web site and their history of the Reard/Freed House. Sure enough, Jacob and Emma Reard were the original residents of the home, which the Sammamish Heritage Society has been working to save from demolition. As a result of this brief meeting, the Issaquah History Museums received the oldest known photograph of the Pickering Barn, the Sammamish Heritage Society received more information on the Reard family from a Reard descendant, and Paul Thomas the address of his ancestors’ home. Since that time, Mr. Thomas has been to visit the home where his grandparents once lived on what would have been his mothers’ 100 birthday. He has also been in touch with the Sammamish Heritage Society. This incident is an example of the value in preserving and sharing historical information. The pieces often come together in unexpected ways, benefiting everyone involved. In 1892, the residents of the rapidly-growing Squak Valley settlement vote to incorporate their settlement as the town of Gilman, named after railroad founder Daniel Hunt Gilman. 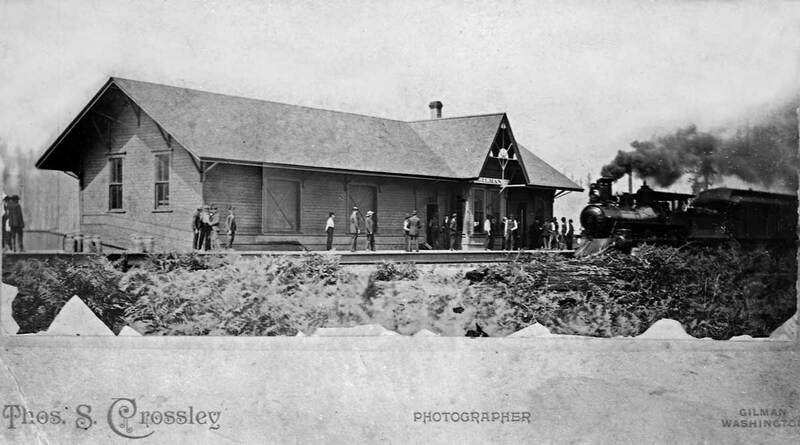 Issaquah is turning 125! The fun will start of April 29th….